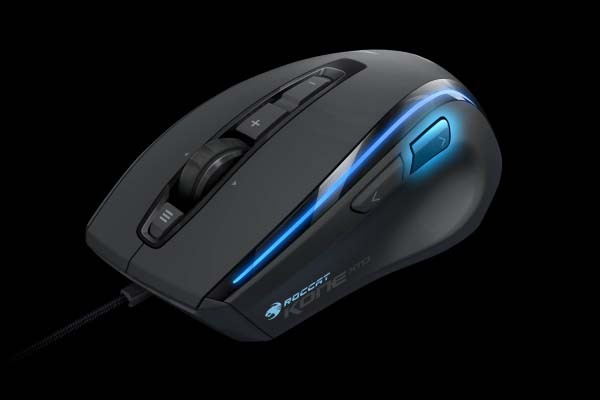 Roccat recently announced three new gaming mice including Kone XTD, Kone Pure, and Lua. Now let’s go on checking Roccat Kone XTD, the max customization gaming mouse.Roccat Kone XTD is a professional gaming mouse that measures approx 13.5 x 7.8 inches and weights approx 123g + 4 optional weights in 5g, 10g, 15g or 20g. The wired gaming mouse features ergonomic right-hand design with soft-touch, ultra-comfort surface for comfortable touch experience, and come with eight fully- programmable buttons and a tough-built 4D mouse wheel, and using unique Easy-Shift[+] technology, you can set two functions for each mouse button and the scroll wheel, plus 8200 DPI Pro-Aim R3 laser sensor in order to provide powerful gaming experience. Moreover, the 576KB of on-board memory can conveniently store all of your macros and profiles, and the integrated 32-bit Turbo Core V2 processor lets you call up any of your custom setting instantaneously. Roccat Kone XTD gaming mouse is priced at $89.99 USD. If you’re interested, jump to Roccat official site for more details. Additionally, also don’t miss other options via “gaming mouse” tag.